This 5-day/4-night tour is packed with unforgettable sights and adventures. 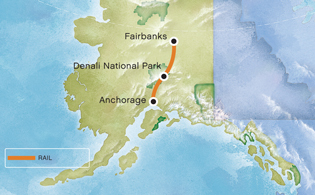 Board luxury rail and venture north from Anchorage to Denali National Park. Enjoy scenic vistas and watch for wildlife as you travel. Upon arrival into Denali, transfer to your hotel and enjoy ample time to explore the area. Spend 2 enjoyable nights in the Denali area, get out and explore by taking an optional tour like river rafting or ATV'ing. Enjoy dinner and a show at the Music of Denali Dinner Theater at McKinley Chalet Resort featuring family-style dining and a spirited original musical about the first men to reach the summit of Denali. Later, re-board the train for an enjoyable trip to Fairbanks. Travel aboard Alaska Railroad's Adventure Class railcar (picture window) from Denali to Fairbanks. Upgrade available. Enjoy an incomparable sightseeing experience aboard luxurious domed railcars. Take in the wide-open scenery as you travel through the Matanuska Valley, a farming region known for mammoth vegetables; past colorful towns like Wasilla, billed as the "Home of the Iditarod;" and along scenic rivers like the Susitna, which means "Mother River". By afternoon you arrive in Denali National Park. Here, you can choose from a wide range of optional activities like river rafting, helicopter flightseeing, or a self-drive Jeep tour. Spend the night at a spacious Denali-area lodge. Overnight Denali-area hotel. Transfer to the airport where your vacation in Alaska is complete.